It’s nearly impossible not to ask a pregnant person, or a person who’s just had a baby, “how are you feeling?” So I will start this post by saying that with the exception of being tired and feeling a little flabby in the core area, I feel great. And because I feel great, I decided to try some jogging. Post-jog, I can now add that I also feel a little tender still in the pelvic floor area but by no means is it painful. And the feeling I had for the majority of pregnancy that my ligaments were ripping apart is gone, so I consider that a good sign of being on the mend. In order to really start running again I have to start somewhere and a walk-jog combo on a beautiful fall day that also happens to be my last day of maternity leave seemed like a good place to start. I’ve been reading about different base building techniques and many of them hinge on walk-jog combinations. I am not sure yet how long I’ll have to do the combo but I’m trusting in my gut I’ll know when I’m ready. I plan to build to a 1 minute walk / 4 minute jog pattern hopefully in another week (so 5 full weeks post-partum) and hopefully will reach a consistent slow jog in the not-too-distant future. 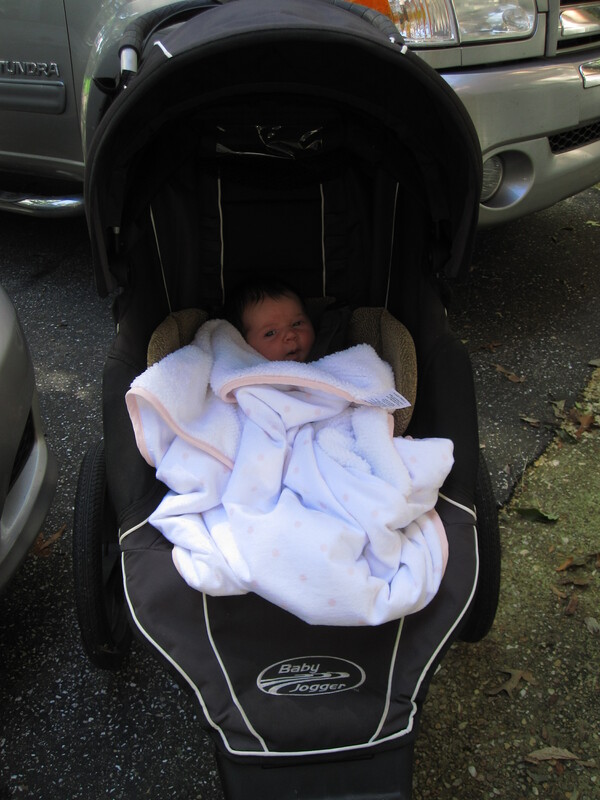 Baby A in the Baby Jogger FIT for the first time; she’s just shy of being one month old. For today’s first “run,” however, I walked for 5 minutes to warm-up and moved into a slow jog for 5 minutes at about a 12:10 pace. After that I alternated walk-jog for 2 minutes each with the jog averaging around an 11:20 pace. I did this with A in the baby jogger and will have her along for plenty of runs in the coming months. I introduced her to the jogger today at just a few days shy of being one month old and recall running with her older brother on his two month ‘birthday.’ At that time, the doctor had no issues with me having a baby in the jogger so long as he was well strapped in; so I added some extra cushioning around A to make sure she didn’t move a hair while we walked/jogged today. Glorious! Jogging felt just like I expected it would, which is to say it didn’t feel at all like it did on my last non-pregnant run but it also felt a thousand times better than my last pregnant run. I wasn’t winded and I didn’t feel any pain in my pelvic area. A little tender (bruised maybe? these are hard sensations to describe), yes, but not the searing pain that forced me to stop running. 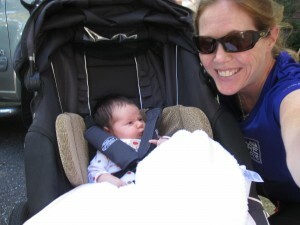 I also had to remember how to run with the jogging stroller which is really an act of perfecting posture. I am inclined to believe that running with a stroller can ruin one’s form and I’ll have to do my best to not let that happen. But in general, it felt SO GOOD to be moving even at a slow jog pace. For me it is not just a physical experience; my mind instantly went into the positive, calm, forward-thinking place it always goes when I run. I felt like I had regained my sense of self, my confidence in what I’m capable of doing and I felt empowered to simply take one step at a time until I’m once again running, training, racing and competing. 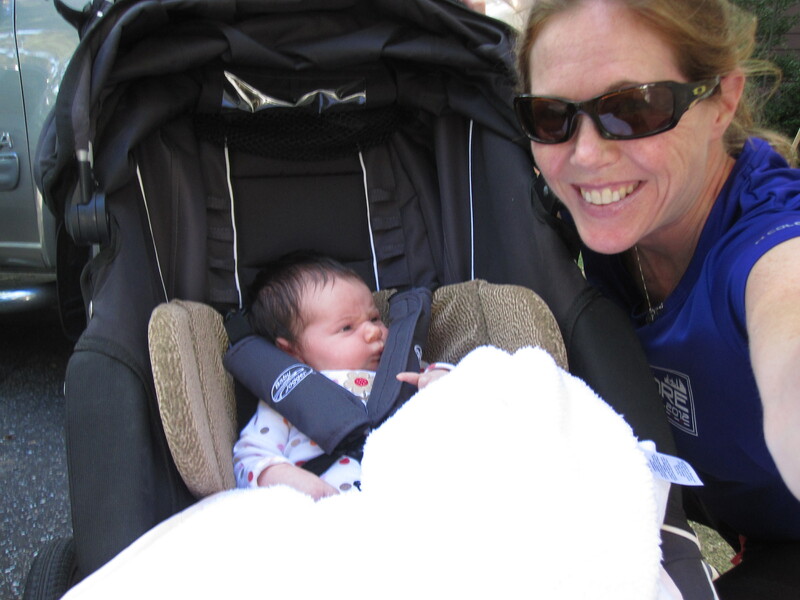 This entry was posted in Running and tagged running pregnant on September 26, 2014 by Natalie.